"Suryagarh Haveli is a unique heritage style hotel in Jaisalmer. The hotel totally proves the often quoted phrase "Opposites attract". The blending of contemporary and the medieval is truly remarkable in every sense. The guests who stay in here constantly feels like time traveling. It is perhaps the most enjoyable hotel to stay in the whole city. Suryagarh Haveli draws tourists from everywhere with the grand architectural design which reflects the Rajputana Heritage in its truest sense. The moment one steps inside Suryagarh, his/her attention is captured by the glorious Rajputana inspired turrets and ramparts. The walls of the hotel, built using sandstone are reminiscent of age old glories. The seamless blend of contemporary with medieval adds a special charm to Suryagarh. Palace Room: The rooms are decorated with 18th century decorations which are interfused perfectly with contemporary amenities here. 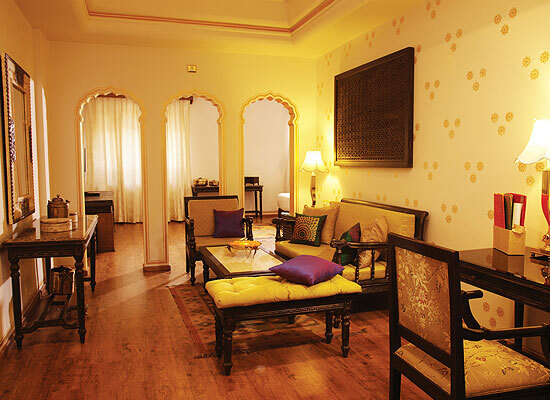 Grand Heritage Room: These rooms carry on the legacy of pride and might of Rajputana heritage. 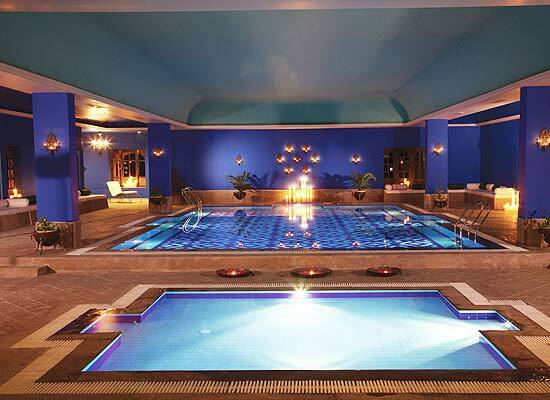 With excellent services offered, the guests can come here to be spoiled. Signature Suites: These spacious suites might be little smaller in size but are completely cozy and comfy accommodations providing every ounce of luxury one desires. Luxury Suite: The walls of these rooms are adorned with frescoes and paintings of royal period. 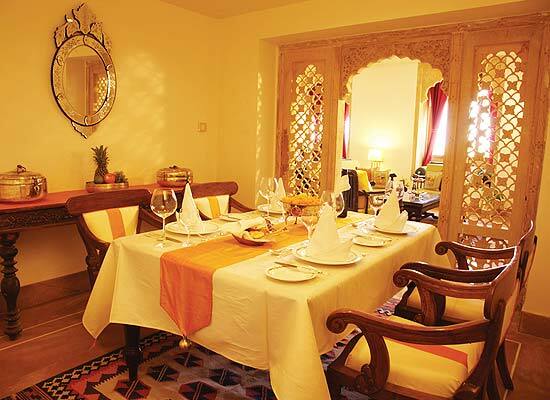 These suites also have a private alcove where guests can enjoy Suryagarh’s classic Kesari chai. 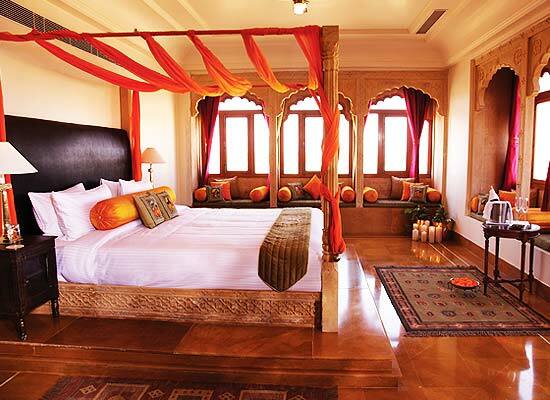 Jaisalmer Suite: These rooms are designed to pay tribute the Golden City and are most luxurious suites in the hotel. The Legend of Marwad: The multi-cuisine restaurant celebrates the Marwad heritage and some of the secretly guarded princely recipes and culinary delights for a royal dinner. Nosh: This spacious restaurant is best suited for enjoying coffees with delicious light food. Draksh:The tired and weary traveler can come here for enjoying refreshing International spirits. 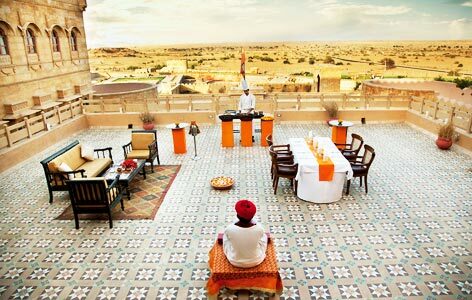 Jaisalmer is one city in Rajasthan that never disappoints any traveler who is looking to escape the dull escapades of city life. The desert town of Rajasthan stands mighty and proud amidst the Great Indian Thar Desert and has witnessed the transformation in times for centuries. Tourists and travelers regard visiting Jaisalmer as a life changing experience; such is the beauty of this enchanting city.